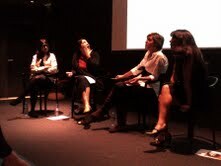 Myrna Ayad moderated a panel of gallerists, of which my dear friends Sunny Rahbar and Asma Al Shabibi. It took place at the Pavilion, an art center that I had never ventured to before. I was impressed by the large attendance and couldn't be more proud of the eloquent women that spoke of their own experiences as vanguards of an art movement in Dubai, and by extension the Middle East. How could I have skipped activities at the Pavilion when I am such an art enthusiast? The reason is that Dubai is saturated with art activities. My fluctuating email addresses cannot handle the amount of invitations that come my way. I may have been harsh on the "diner guests" that convened to meet Nazif Topcuoglu and didn't attend his opening show at the Green Art gallery, but I must admit to missing some shows, in spite of my own enthusiasm, just because I can't be there each and every time. 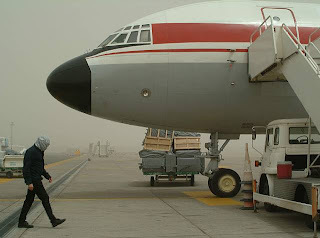 There is so much going on the Dubai Art Scene! After the academic atmosphere of the Pavilion, I ventured to DIFC Art Night, with my 7 year old daughter in tow, to support Art Space and XVA. The cool Dubai evening, the beautiful people such a venue attracted, the DJ in the house made for a fun time. I met an artist I long time admired, Tarek AlGhoussein. He is amongst the few UAE based artists, such as the Haerizadeh brothers, Hesam Rahmanian, Lamia Gargash and Jeffar Khaldi, all of whom I am honored to be acquainted with. This single day on the Dubai Art Scene would not be counted as eventful for many because we have now been spoiled by the numerous shows and activities. As a public, we have become more selective. Yet the scene doesn't cease to develop, more innovative and creative each time....and especially very enriching. No one can deny it: Dubai is on the art map. I was indirectly invited to attend the same function,but it seems the PT blogger used her 7 yr old inquisitive daughter as my subsitute.It is so important to expose the young generation to art,sport and music that will stay with them for ever.